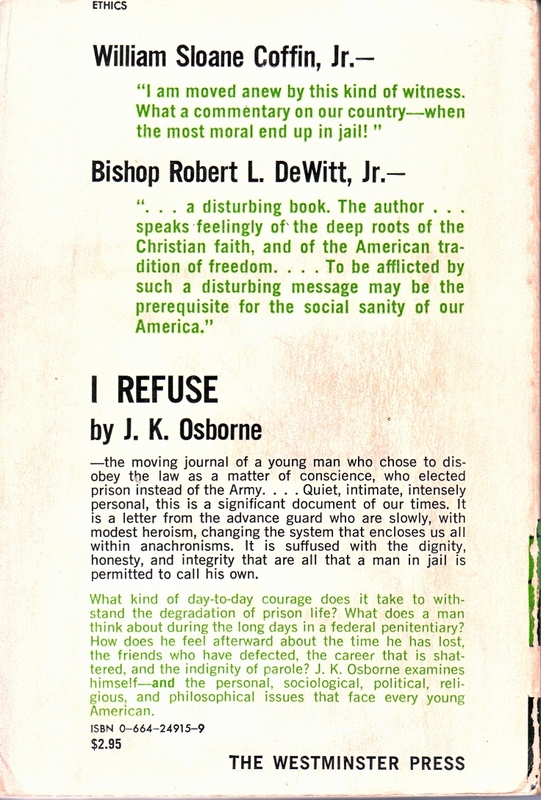 I Refuse: The Prison Memoirs of J. K. Osborne, The Westminster Press, Philadelphia, Pennsylvania, 1972. FOREWORD: What can a peaceful man do with a million bombs? The first thing he must try to do is survive. Almost as important is that he survive with dignity. Without true human dignity, survival is improbable, and life merely a faint echo of what it should be. We are again faced with that all-too-familiar dilemma, which demands of conscientious men a moral decision followed by active commitment. There is an ancient proverb that says the road to salvation is like a razor’s edge. The road to the preservation of mankind is no less precarious, especially in this age when mankind can be doomed by the whims of a few powerful men. The individual man may not have much to say about his doom, but he has everything to say about his damnation. 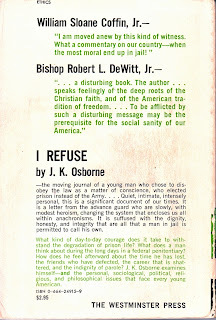 I had been taught throughout my life here in the United States—taught by my family, my religion, my teachers, my society, my culture—that a man must at every moment exercise his manhood, and that he could do this in only one way: by following the voice of his conscience and bearing the consequences of his decision. How odd to find, then, that after following this dictum I was to be imprisoned as a result! I began this record-journal-diary on the day of my arrest by the FBI after a five-count grand jury indictment for draft resistance. 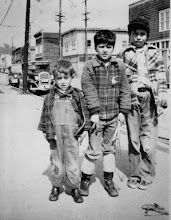 I was living in Seattle, Washington, where I had made my home and live at the present. It was kept—I don’t really know why it was kept: maybe to objectify some of the unbelievable things that were happening to, in, and around me. Many things have changed since the date of my arrest: the political and economic situation, varying national and international crises, my own personality, some of my beliefs. The pages that follow are nothing more than a record of my own response to the call of war. I make no pretensions at speaking for my “generation” or for any other group. Nevertheless, I hope there are a few individuals here and there who will hear this “cry in the wilderness” and recognize in it some of their own anguish. I was released from prison on Thursday, December 11, 1969, after serving eighteen months and four days. It is a simple but numbing experience, being given your “freedom.” At 9:30 A.M. I went to the dress-out room where I was issued civilian clothes, a coat, and a handbag for personal items. An hour later, I boarded the boat for the twenty-minute ride to the mainland. It was a harsh, windy, cold day; the waters were choppy, the boat lurching and rocking. For the length of the trip I stared back at the prison, set on the edge of McNeil Island, as it grew smaller in my sight. In this way I had hoped to make its memory fade within until it would one day become a speck in my total life’s experience. But much, much remains to be done. And who is there to do it? Those same people who have pushed or pulled us forward in the past: youth. A minority of the “silent generation” opened the way for the civil rights movement. 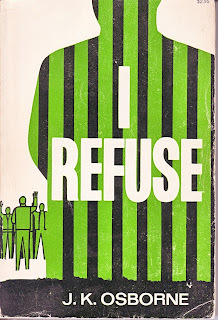 A larger percentage of youth in the ‘60s opened the door to different life-styles, added impetus to the cause of civil rights, saved—yes, saved—this nation from going mad and pushing all the buttons in its futile effort to destroy a tiny Asian nation. The youth of the ‘70s must take the show from here. Why? I am not a very active man in the usual political sense. I worked for the John Kennedy campaign, I “dropped out” to live in Haight-Ashbury in late ’65 and early ’66, I worked in the “poverty program” for a “Great Society,” I taught school, struck for peace, went to jail rather than to war. But even this much has left me worn out, an old man before I’ve turned thirty. This same sense of premature aging has struck most of my contemporaries. Our successors, those 18-28 in the next decade, must do what they can to see that our actions have not been for nothing. This is as it should be. I do not mean to imply that I have jelled, as events jell in time’s mold. I am saying as an individual, who grew up in the ‘50s and aged too quickly in the ‘60s, who took part in some of the events of the last ten years, that I simply am not sure where I go from here. We have just entered the ‘70s, and already I’m afraid, disillusioned, despairing, because of events around me. The Chicago Conspiracy trial. The violent repression of the Black Panthers. The invasion of Cambodia. The absurdity of Spiro Agnew, and the millions that applaud him. Kent State. Jackson. Atlanta. All this, let me remind you, taking place in one year! I have lost all faith in capitalism. I question democracy. I wonder about my pacifism. Will we survive the ‘70s? Will we do so only by a loss of freedom? Will Z [A reference to the book written by the Greek writer Vassilis Vassilikos, later made into a movie by Costas Gavras.] happen here? And Catch-22? Heller, and Nichols, did a very simple things—took all the truths of Patton just one step farther, to show reality, the reality of war, greed, hate, death. Not the truth, perhaps, but the reality of our existence. There was no applause. We can face the truth, if it’s liberally dosed with glory, bravado, piety, and doesn’t demand that we make any moral judgments. But we are not yet equipped to face reality. Perhaps when we are, we can find new truths, new definitions of good and evil. What astonished me most, after my release, was the feeling that nothing had changed! My friend R.L., who had invited me to stay with him until I got adjusted to being out, asked me to leave, two days after, for this reason: my presence embarrassed him! One of my brothers-in-law forbade me to enter his home or to visit my sister and nieces. I was unable to find employment. I went back to school to complete work on a master’s degree, and the five years since I had been in a classroom, nothing had changed there either. But I . . .I had changed; this I knew beyond anything else. It seems to me that the world is governed by injustice, vengeance, greed. Hate breeds hate, while love breeds not more love but withers when it rests upon the loved. Those who love are repaid not with love, or even kindness, but with indifference. In such a world I am a foolish man, and my quest the wandering of an idiot. My going to prison then, before everything else, was an act of faith. What is it I believe in? I believe man is capable of higher things than making war; I believe he is capable of bringing permanent peace to his world; I believe he must do this very soon, before his frenzy burns him off the earth forever. I believe that man will learn by doing; some must be pioneers in discovering new vistas, new faiths; those who go ahead in the matter of discovery are usually persecuted; in spite of all persecution, unless time runs out for humanity, there will come a time when the masses will follow the explorers, the prophets, and by following the example of a few peaceful militants, will bring permanent peace. I believe we can make this hell of an earth just a step below heaven. We have separated ourselves a great distance from the angels; it was not meant to be so. This is what I believe; this is where my faith lies—in man—but faith does not wipe away doubt. What I believe we can do and what I believe we will do are not always the same. I see no contradiction, though others do, when I say I have faith in man, but at the same time I doubt whether he will survive the present rush to catastrophe. Were I barren of faith in man, it would have been an easy and natural matter to have gone to war, to have supported the war in any way, or just to have remained neutral. Had I not had faith, I would not have come to prison. Without faith in man’s capacities it is an easy thing to kill a man, for murder is the ultimate non-recognition of his being. If we cannot be near to angels, if what we can produce through our efforts of mind and body and will cannot be heavenly, if our spirit is not at one with the Spirit of Being, then there is nothing, nothing worth saving in our world, including our own lives. 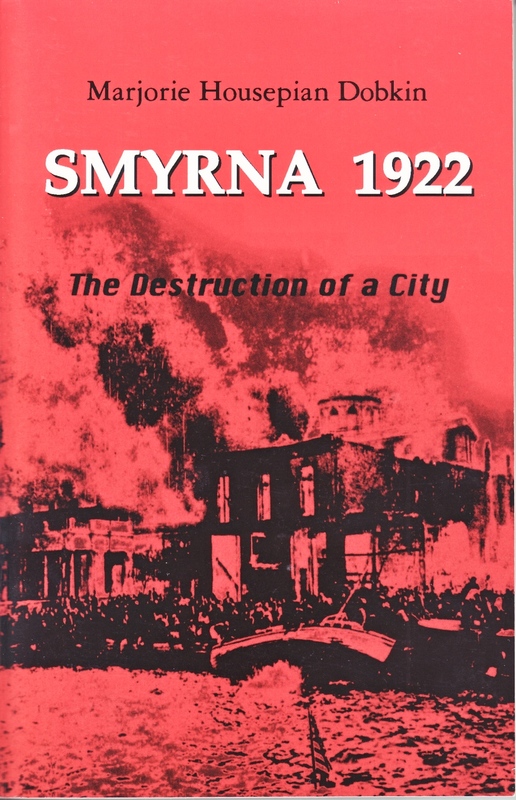 Consequently, self-destruction through war is natural; indeed, it is a desirable and necessary goal of our humanity. I see where man is headed; I also see the direction he could take; where do I go now? Do I abandon thoughts of man’s possible glory, and all action which I could do which might help, in its minute way, to bring man closer to that glory? Or, seeing what man—and I as a man—can possibly accomplish, do I turn away from man’s present state of self-destruction and go toward that state of possibility? Do I live my life according to present realities—which are really negations of reality—or do I live my life according to my faith in man? My answer has been given, and were I asked again it would be the same. I believe men can lay down their arms, forever. I did, and if one as weak, as miserable, as fault-ridden, as far from angels as I, can lay down his arms, then surely so too can every other miserable creature on this earth. I live now in a room on Seattle’s Capitol Hill. It is a small room, but the house is large, and there are others in it. I read much, and write, and listen to music, though my tastes in all three are not those of my generation. I have a calico cat named Maggie, and a white canary, Mozart. The three of us get along just fine. Vazambam’s afterword: Besides writing this striking volume of prison memoirs, Ken Osborne was also the driving force behind Madrona, the one who first had the idea for the magazine, who came up with the name and who was also the magazine’s chief financial backer; I was a full-time student at the UW, working part-time for Seattle Housing Authority’s Neighborhood House, and John Levy was thousands of miles away attending Oberlin College. Editing duties for the regular issues were shared between Ken and I while John was responsible for the special issues, which included an entire issue devoted to Cid Corman and another one on the prose poem; I think John edited one more but I can’t be positive because I can’t find that particular issue anywhere. 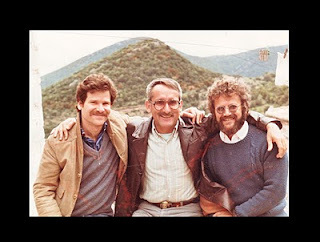 The three of us met at the 1970 Writer’s Conference in the Rocky Mountains, a two-week affair which used to be held annually at the University of Colorado in Boulder and we have been friends ever since then. Before your verses blot it away. Moderator’s comments: Were he still alive, I’m sure the illustrious, ill-fated Mayakovsky would agree. Would one cease to sing? The Editors of Madrona (Seattle, Washington, 1971-1979? 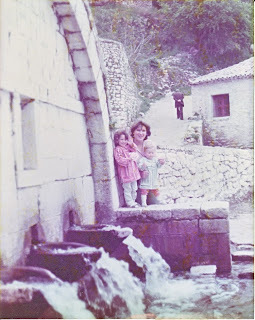 ): Photograph taken on the terrace of Eleni’s house in Remmatia, summer, 1985. 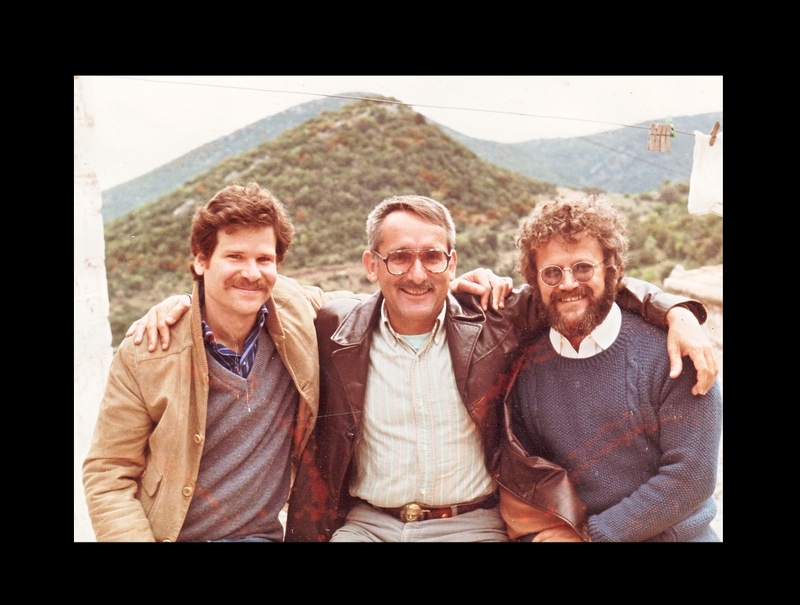 From left to right, John Levy, JK (Ken) Osborne, Vassilis Zambaras—those were the days (including those much earlier than these), my friends. Ah, but do not let the somber black bordering deceive you: All three are alive and well and living their separate lives, though separated by thousands of miles of earth and water: Levy works for the Public Defender’s Office in Tucson, Arizona, Osborne is a retired high-school teacher now taking it easy in Marica, Brasil, and Zambaras is self-anointed Poet-in-Residence in the Peloponnese. More on Madrona and its editors coming up soon. Moderator’s comments: In all seriousness, could this indecorously punning poem be a veiled allusion to Graves’ Good-bye to All That? If so, it would serve to reinforce the opinion—shared by many seasoned and decorated veterans of the poetry wars—that Cinquor has finally crossed the thin, hazy line separating poetic decency from crass stupidity; he should therefore be declared persona non grata in La República Musa and dispatched to No Man’s Land with no further ado. 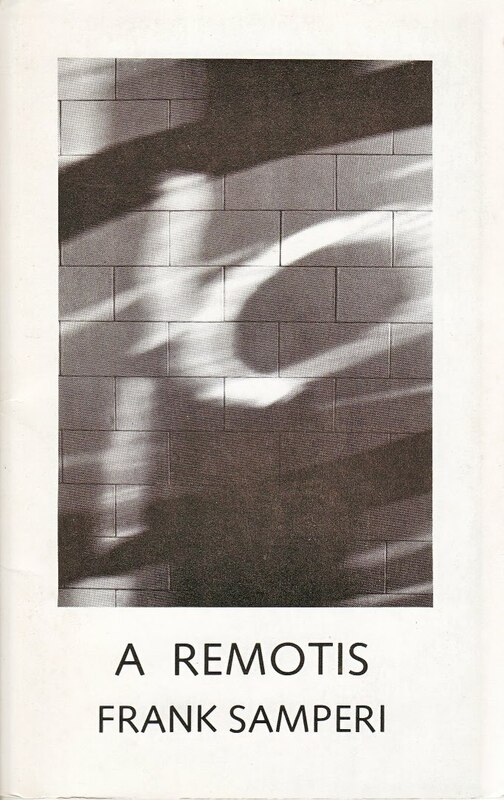 A Remotis, published by Querencia Books, Seattle, 1979. 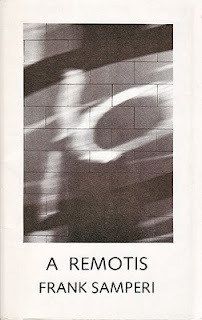 Cover photograph by Mona Nagai. See Claudia Samperi-Warren at poetfranksamperi to read some of her father’s poems from this beautiful little book edited by John Levy. Where we find our indefatigable poetic muckraker plowing through the once-fruitful, now seedy lower forty only to find nothing out there standing but the husks of sodbusters stalked to death by a transmogrified jolly Green Giant. Those halcyon days of yore? To have never existed before. When they no longer appear? Klutzes cluttering up my rear? I said it’s deadline time! Moderator’s comments: I don’t know about you but I find Cinquor’s tirade against deadbeat poets totally uncalled-for because it oversteps the bounds of poetic decency; after all, where would our muse be if it weren’t for that long illustrious line of bootlickers waiting their turn to grovel at her feet—or should I say feat? So I draw a boy and a girl. 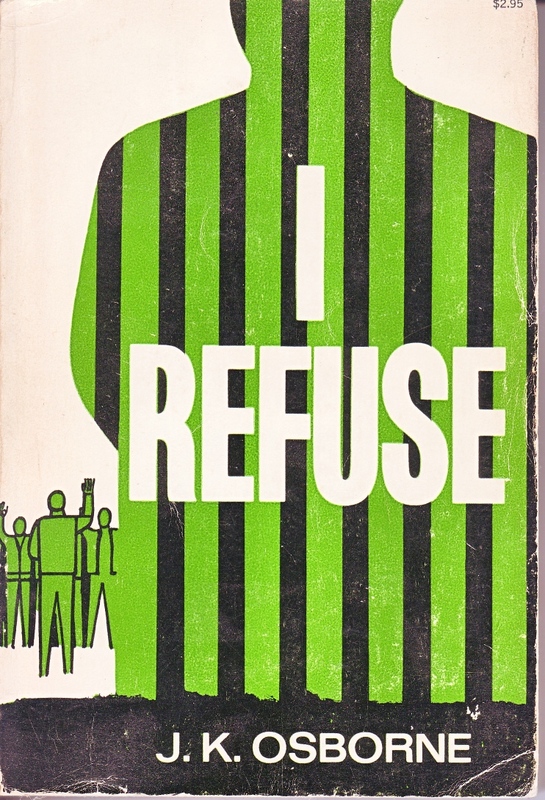 By Marjorie Housepian Dobkin, Newmark Press, N.Y., 1998 (Second reprint of Faber edition, London, 1972). After reading the introduction and the closing chapter here, get the book and see for yourself how little has changed in the world of diplomacy. Spring, 1984 at the fountain in the mountain village of Kefalovryssi, Messenias—about 40 minutes north of Meligalas: Eleni 22, Efiniki 3, and Tasso 1, the old man in the background departing the scene? Old enough to know what it was like to be that young.